When our customer’s companies started to grow, we realized our Discovery & Training wasn’t enough. Some required training for new hires as their business grew, while others were getting calls for challenging projects and wanted HMI’s expertise to help them win those bids. Having our own concrete lifting and raising business, we’ve been there, and know the growing pains and challenges that are thrown at you. One of our experienced technicians arrives at your doorstep for a hands-on training at your facility. Training can be the technical reinforcement from the Discovery & Training Seminar or customized based on your needs. Perfect for training big crews and advanced projects. 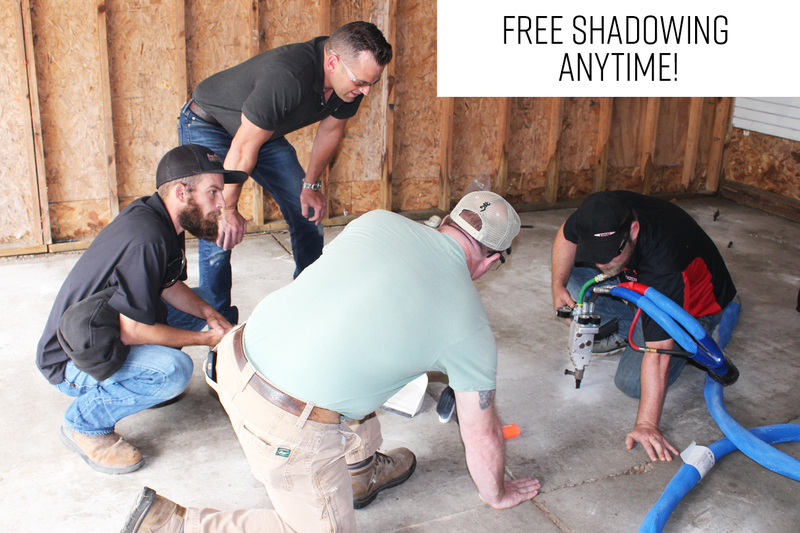 We’re happy to have you shadow crews on residential job sites. You may find it convenient to schedule this before or after your two day Discovery & Training Seminar, or when you pick up your HMI system. Of course, we’re always happy to see you, so feel free to schedule crew shadowing anytime between April-November. Perfect for training a new hire or “intro” to the industry training. Would you like on-site help or to shadow a real, working crew? Perhaps some direction on complex job bids?